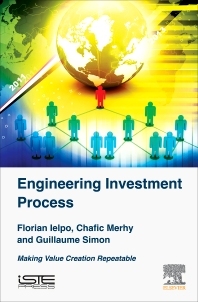 Engineering Investment Process: Making Value Creation Repeatable explores the quantitative steps of a financial investment process. The authors study how these steps are articulated in order to make any value creation, whatever the asset class, consistent and robust. The discussion includes factors, portfolio allocation, statistical and economic backtesting, but also the influence of negative rates, dynamical trading, state-space models, stylized facts, liquidity issues, or data biases. Besides the quantitative concepts detailed here, the reader will find useful references to other works to develop an in-depth understanding of an investment process. Professionals that would need guidance in the building of an investment process, both for active and passive fund management. Quantitative and non-quantitative investment managers, emphasizing must-haves and pitfalls that any fund manager should be aware of. Risk managers or any manager needing a reference for assessing the supervision of an investment process (CEOs, regulators). Master class teaching and Academics interested in practical applications of academic research. I.2 Why do we allocate? Florian Ielpo is Head of Macro Research at Unigestion and associate researcher at University of Paris 1 in France. Chafic Merhy is Head of Credit Quantitative Research at Natixis Asset Management. He is also a lecturer at University Paris IX Dauphine. Lecturer, University Paris IX Dauphine. Guillaume Simon is Research Manager in Equity Statistical Arbitrage for Capital Fund Management.